An Italian Cream Cake for Blogoversary! It’s hard for me to believe that it was just one year ago today that I said hello to all of you beautiful friends in the blogosphere. I have had just a great time meeting new friends and sharing my thoughts on recipes and the beauty of life around us. It’s been simply a wonderful, rewarding experience. So for this memorable day, I decided that the one and only birthday cake to make and enjoy is the very special Italian Cream Cake. This cake is very near and dear to Southerners’ hearts and I can’t quite figure that out, because there are so few Italians in the region, at least there’s not many in South Carolina! But no matter, the recipe is a real treat, and Southerners have the best food taste and skills to boot! Although many of you have your own versions of this delectable goodie, my recipe is straight from Southern Living magazine (I don’t remember which issue, but it is also featured in many of their cookbooks). I have never seen a recipe for this cake in any Italian cookbook — Italians don’t use cream cheese or coconut in Italy, so it’s my humble little hunch that this cake is really Southern in origin and not from Italy. Set me straight on this origin, anybody. . . I hate to speak incorrectly. The only adjustment that I make is to DOUBLE THE FROSTING! Grease and flour three (3) 9″ round cake pans. Line with wax paper and then grease the paper also. Cream the butter; add sugar, beating well with an electric mixer at medium speed. Add egg yolks, one at a time, beating after each is added. Add to creamed mixture alternating with milk, beginning and ending with the flour mixture. Stir in pecans, coconut and vanilla. Beat the egg whites (need to be at room temperature) on high until foamy. Add the cream of tartar; beat until stiff peaks form. Gently fold beaten egg whites into batter. Bake at 350 degrees for 25 – 30 minutes or until a wooden toothpick inserted in the center comes out clean. Let cool in the pans for 10 minutes. Remove from pans; peel off the wax paper, and let cool completely on wire racks. Sprinkle each layer of cake with 2 Tbsp. of rum. Combine cream cheese and butter, beating until smooth. Gradually add powdered sugar and beat until light and fluffy. This cake is just OH SO EXCELLENT! Previous Post: « A Horse Lovin’ Cat . . . and a Chocolate Cake in the Oven! Happy birthday “La Bella Vita!” This cake is perfect. Great call on doubling the frosting. I love the nuts mixed with the cream cheese too. Delicious. I don’t think it’s Italian either. I’m gonna have to do some research on it’s origin, now that I’m curious. Happy Blogoversary! I agree with you about the origin of this cake — must be southern. My hubby is Italian. The first time I heard of this cake, I thought it was the one I made (a hot-milk sponge cake with coffee/rum sprinkled on the layers, then sweetened whipped cream as frosting and filling with chocolate shavings on top. When I saw what it actually was, I said where did this come from? I couldn’t find it in any Italian cookbooks either, and I thought it was some kind of a Southern attempt at an Italian cake. But I will say, it is quite delicious and your photos make my mouth water. Happy Blogiversary my sweet and beautiful friend! This cake is a wonderful way to celebrate. And you won my heart by doubling the frosting! Ohmigod, I almost dribbled on the computer keyboard just reading the recipe. This looks amazing and sounds delicious. ciao, complimenti è davvero bella questa torta e auguri per il blogoversary! Happy blogoversary! I wish I could reach into my computer screen and grab a slice of that cake–lol. Holy COW that looks delicious. Congrats! Happy Blogaversay to you, Happy Blogaversay to you, Happy Blogaversay dear La Bella Vita, Happy Blogaversay to you! Holy Cow, you are killing me with this Italian cake Roz! Please send me a piece… I’m just a few states away! Oh my goodness…I have been DYING to make an Italian cream cake for the longest time and I definitely am going to after seeing your gorgeous photos. They bring back memories of my grandmother making this for my birthday when I was little. Love it! Thanks for posting the recipe! happy bogoversary “la bella vita!” i love your new design, it is very italiano looking! love it, ok, i copied the cake recipe down, it looks delicious! have a wonderful day! Congratulations on your 1 year blogoversary, Roz! You have a GREAT blog! Ciao bella! This looks delizisoso! Congratulations on your blog-oversary Roz! Evviva! Baci! Oh my….I am totally drooling now….will have to make this cake immediately! YUM! 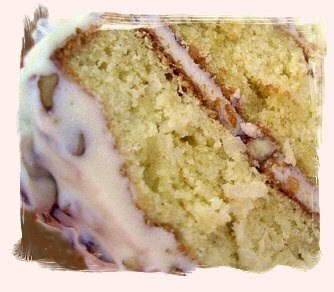 Did you toast the nuts for this cake and frosting. Also, what brand of light rum did you for this cake. Can this cake be served to children, by the cake layers are soaked with rum. Is this the double recipe for the frosting. Oh my. Oh my. Oh my. I was all set to make your strawberry cake, but I do think this one might win out…this looks heavenly!! I’ll let you know which one I make! Another year has passed again…. Happy Blogversary to you. Your cake is a cake for all occasions. Your blog about Italian cream cake is really awesome. I love this recipe very much.I will definitely try this recipe. The process of your cake is very simple and easy. I like Italian culture, tradition, italian food etc . Last summer I have visited Italy as well as I have visited Italian restaurant. I have enjoyed Italian food very much. (Our names are almost identical!) Thank you for your visit and kind comment! It is an absolutely delicious cake that I hope you can bake and enjoy someday soon! Hope you stop by again!